Sponsorship is key to the health of amateur golf in Ireland and the ILGU and Revive Active Products could not have been happier with the first year of their three-year deal to promote the Revive Active National Fourball Championship. 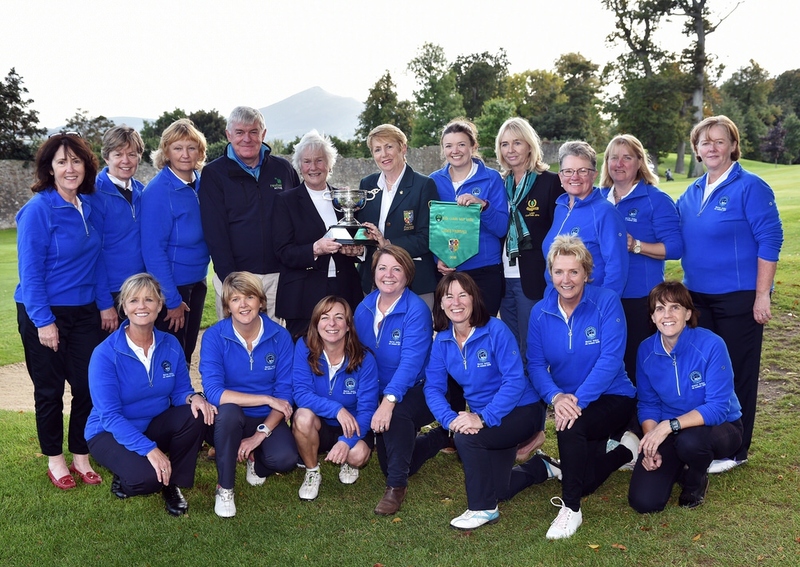 With more than 41,000 active female golfers, the newly sponsored Revive Active Ladies Fourball is the leading inter-club fourball event for lady club golfers in Ireland. Established in 2004, the event is one of the most popular fixtures on the calendar and open to all members of affiliated golf clubs who hold an ILGU handicap. “The ILGU National Fourball sponsorship represents a great partnership and a great way to spread the Revive Active message amongst active Irish women who enjoy the challenges of playing golf at a highly competitive level,” said Daithi O’Connor, Managing Director of Revive Active. The All Ireland finals saw the winners of the four regional finals square off at Old Conna in Dublin over two days. Newlands overcame Carton House in Region 1 with Rockmount dominating Region 2 for the second year running with victory over Belvoir Park. The 2014 All-Ireland champions Cahir Park represented Region 3 again after overcoming Thurles at regional level while in Region 4, City of Derry prevailed over Tuam. Beaten by Ballybunion in last year’s final, Rockmount were determined to go one better and made no mistake against City of Derry in the semi-finals, running out 3.5 to 1.5 winners. Their top pairing of Jo Donaldson and Barbara Fleet led the way as the beat Naoimh Quigg and Karen Jackson 4 and 3. One up wins for Janet Dowds and Deirdre Russell and Jan Lindsay and Frances LawtherIt were enough to secure a place in the final against Newlands, who beat Cahir Park 3-2 in the other semi. Despite a 7 and 6 defeat for their top pair, Esme Murphy and Grainne Friel, wins for Margaret O'Connell and Leonie Colgan, Ann Hughes and Louise Halpin and Rebecca Carroll and Mary K O’Mahony were good enough to secure overall victory. In the final, Rockmount got off to a hot start with their top pairing of Donaldson and Fleet beating Murphy and Friel 6 and 5. Newlands dominated the second match with O'Connell and Colgan beating Ciara Agnew Leonie Power 3 and 2 to level the scores. However, after Rockmount’s Lindsay and Lawther beat Hughes and Halpin and Carroll and O'Mahony replied for Newlands, it all came down to the middle match. Rockmount’s Dowds and Russell were one down to Orla Heffernan and Pauline Curtis playing the 18th but won the hole to force tie holes. The Ulster pairing the dug deep and secured victory in dramatic fashion on the 21st with Russell holing the winning putt. Michelle Keating (20) & Chris Noonan (22) lost to Rebecca Carroll (10) & Mary K O'Mahony (15) 3&2. Maire McReynolds (15) & Rosaleen McAnulla (21) halved with Maureen Entwistle (13) & Oonagh Devine (23) (called in). Maureen Entwhistle (13) & Oonagh Devine (23) lost to Rebecca Carroll (10) & Mary K O'Mahony (15) 2&1.